In Mina's Trial, you will have to defeat the trial captains in each island in order to fight the Fairy-type Totem Pokemon. 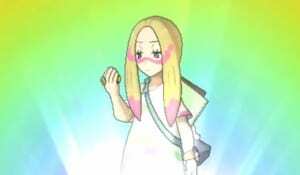 This walkthrough will guide players on Mina’s Trial on Ultra Sun and Moon Poni Island. Click here to go to our Pokemon Ultra Sun and Moon Walkthrough Directory! Go to Mina’s house and talk to her. A battle with Mina commences. Mina uses a Lv.51 Mawile, a Lv.51 Granbull, and a Lv.51 Ribombee. Since she specializes in using Fairy-type Pokemon, you can use a Steel-type Pokemon to exploit its weakness. In addition, it is better if you use Pokemon with high Sp. Atk. After the battle, Mina gives you a Pink Petal item. You will need to battle 3 more captains in order to get other colored petals. Head to Hau’oli Cemetery to defeat the second captain. After talking to Hau, the battle with Captain Ilima commences. Ilima uses a Lv.51 Gumshoos, a Lv.51 Smeargle, and a Lv.51 Komala. Have several Pokemon with high defense as the Pokemon that the captain has specializes on physical attacks. Head to Lush Jungle after the battle. Battle Captain Lana (Ultra Moon) or Captain Mallow (Ultra Sun). Lana uses a Lv.51 Lanturn, a Lv.51 Cloyster, and a Lv.51 Araquanid. Mallow uses a Lv.51 Trevenant, a Lv.51 Shiinotic, and a Lv.51 Tsareena. You will be given the Blue Petal (Ultra Moon) or the Green Petal (Ultra Sun) after the battle. Head to Wela Volcano Park. Kiawe uses a Lv.51 Arcanine, a Lv.51 Talonflame, and a Lv.51 Marowak (Alola). Use Water-type and Rock-type Pokemon for an easier battle. After the battle, you will have to fight a Lv.48 Magmar. After defeating the Pokemon, you will be given the Red Petal item. Obtain the Yellow Petal item from Sophocles in the observatory. You will have to fight him in Ultra Sun in order to get the item, but in Ultra Moon he will just give it to you immediately. Sophocles uses a Lv.51 Togedemaru, a Lv.51 Magnezone, and a Lv.51 Golem (Alola). Head to Aether House and battle Captain Nanu in the area. You won’t have to battle him in Ultra Sun, just talk to him and he will give you the Black Petal. Nanu uses a Lv.52 Sableye, a Lv.52 Absol, and a Lv.52 Persian (Alola). Use Fighting-type and Fairy-type Pokemon for an easier battle. After the battle, head to Seafolk Village. Present the petals to Mina and she will give you the Rainbow Flower item. The battle with the Totem Pokemon commences. The Totem Ribombee is Lv.55. It calls a Lv.53 Pelipper and a Lv.53 Blissey. Use Steelium Z against Ribombee for an easier battle. You will be given a Fairium Z after defeating the Totem Pokemon and completing Mina’s Trial.